On a tour at the Carnegie Museum of Art, six visitors sat in front of a painting of a somber landscape, talking. The painting’s dark colors signal an impending storm as a group of chickens stand under an elm tree across from a barn. The tour guide questioned the visitors about the painting, asking them to describe their thoughts and reactions. “Chickens always run for shelter in a storm. What was the artist thinking by picturing them oblivious to the storm?” the visitors responded. Though from the outside it may look like any other tour, this tour is designed specifically for individuals with dementia and Alzheimer’s, as tour guides are trained to ask straightforward questions and interpret responses that may be confusing or non-verbal. CMOA holds one such tour per month as part of a program called In the Moment. The program has become an integral part of the CMOA, according to Hattie Lehman, assistant curator of education, learning for school students and adults groups at CMOA. Lehman is responsible for the entire program, from recruiting volunteers to communicating with partner organizations. A tour includes up to six individuals with dementia, each accompanied by a caregiver from Woodside Place — a memory-care community and a part of Presbyterian SeniorCare Network. The visitors tour about six works of art, including paintings, sculptures and photographs. 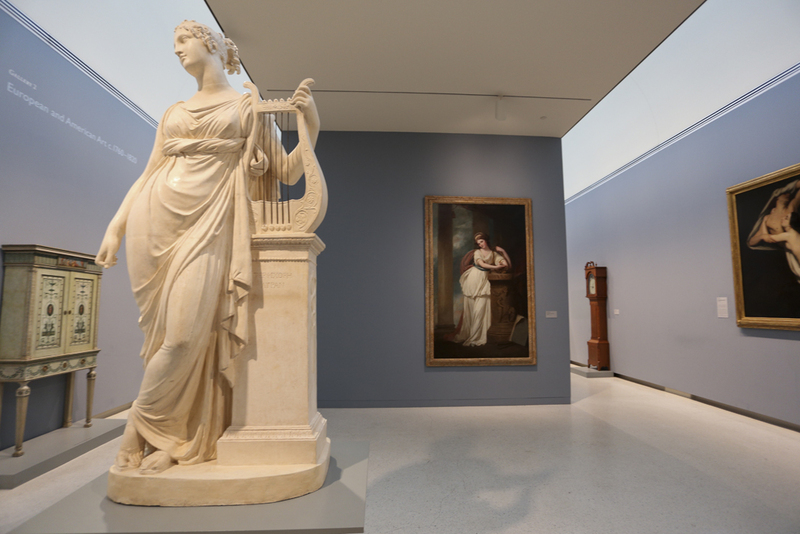 The tour guides, called docents, include some historical information on the art in the tour, for the benefit of the resident and the caregiver, but focus primarily on allowing the senior citizens to enjoy themselves. After piling out of the van from Woodside Place, the senior citizens are given name tags so the docent can call on and speak with them to aid in facilitating conversation. According to Lehman, the program also sends the senior citizens home with a small keepsake — such as a postcard — to potentially “trigger their memory” of a tour they might otherwise forget because of their dementia. Dementia is an overarching term for symptoms that typically strike in old age and affect a person’s memory, their ability to think logically and even their personality. Alzheimer’s disease is one of the underlying causes of dementia, along with Parkinson’s disease and Huntington’s disease. Dr. Eric Rodriguez, a co-investigator in the Clinical Core of Pitt’s Alzheimer’s Disease Research Center, works with other researchers to study the changes in the brain caused by Alzheimer’s disease. The center’s goal is to create a more reliable way of diagnosing Alzheimer’s and to craft more effective treatment plans after individuals have been diagnosed. “Dementia means you have some kind of progressive brain disease that has rendered you unable to perform the normal activities of daily living. You have something wrong that has now made you need the help of others to get by day to day,” Rodriguez said. The docents often ask the senior citizens to describe what they see in a picture, or to describe their general or emotional response to a piece of work. Because of their disease, there are times when a resident may have trouble responding verbally. Sometimes, the docents may need to be rephrase a question so the resident understands it or accept an emotional response — like laughter, crying or agitation — as an answer. Questions tend to be open-ended and general so that they are not too challenging for the senior citizens, and there is generally no right or wrong response. “It’s just about honoring them as a person and acknowledging them even if they can’t [verbally] respond,” Lehman said. The program started in 2008, when Woodside Place contacted Lehman’s predecessor at CMOA. The community was looking for somewhere to take their residents where they would be both comfortable and welcome. To work with Woodside Place, CMOA piloted In the Moment to meet the special needs of the senior citizens. In the Moment was born from a similar program at the Museum of Modern Art in New York City called Meet Me, which uses similar tours to make art accessible to those with Alzheimer’s or dementia. Sue Cavanaugh, who has been a docent with In the Moment for five years, said the tours’ ability to draw in visitors and interact with them has led to an overwhelmingly positive response from both the visitors and their caregivers. According to Rodriguez, the improvement seen in the senior citizens immediately after the tours falls under the category of alternative treatment. In many cases, medicine does not work as well as it should for patients with dementia or Alzheimer’s, so Rodriguez suggests other approaches, such as socialization and cognitive stimulation. “If you put somebody under an MRI scanner while they’re, say, watching a movie of people interacting, their brain is very active trying to understand the words, the facial expressions, the body movements, they’re visibly scanning that crowd trying to understand them and at the same time they’re trying to formulate their responses,” Rodriguez said. This type of thinking and processing can get the brain working in ways it wouldn’t on a day-to-day basis, which can improve the mood or functioning of individuals with dementia. In the Moment tours, and art in general, can be extremely beneficial to the elderly and those suffering from dementia. Analyzing art can be both a form of cognitive exercise as the senior citizens recognize pictures and faces in the artwork and a form of socialization as they interact with the docents and formulate responses to questions. But giving tours becomes significantly trickier when the participants might struggle to even remember where they are. The solution to this lies in the docents — the volunteers who guide the tours — and the special way in which they interact with the senior citizens. With three active docents for In the Moment and nine in training, numerous individuals over the years have given tours and countless people with dementia in the community have been positively affected by them. To make sure they can handle the specific challenges that come with dementia, and to teach them how to interact with individuals who have memory loss, all In the Moment docents must go through a training program before they give their first tour. Training includes a trip to Woodside Place, where the volunteers get hands-on experience communicating with the senior citizens. “[It’s] more about putting yourself in their place and what are they experiencing even as an elderly person,” Lehman said. In addition to the visit, volunteers also shadow experienced docents such as Cavanaugh. Programs like In the Moment are not only important to these senior citizens in particular, but also to communities where there may be a stigma surrounding older people with mental illness. This is true especially in a place like Oakland where the population is overwhelmingly young. “Art does not live in a vacuum. Making these tours accessible to the various people and groups that make up a community can only serve to enhance how to view the world we live in,” Cavanaugh said.